The Vietnam War was a tragic and dismal failureat least that is what the mainstream media and history books would have you believe. Yet, Phillip Jennings sets the record straight in The Politically Incorrect Guide™ to the Vietnam War. In this latest P.I.G.”, Jennings shatters culturally-accepted myths and busts politically incorrect lies that liberal pundits and leftist professors have been telling you for years. The Vietnam War was the most importantand successfulcampaign to defeat Communism. Without the sacrifices made and the courage displayed by our military, the world might be a different place. 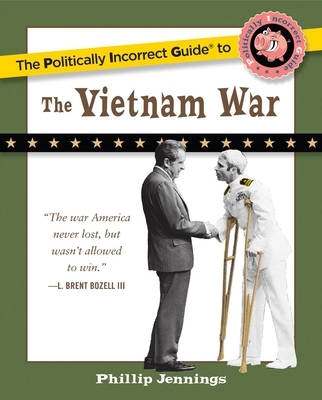 The Politically Incorrect Guide™ to the Vietnam War reveals the truth about the battles, players, and policies of one of the most controversial wars in U.S. history. Phillip E. Jennings served in Vietnam with the United States Marine Corps, flying helicopters, and in Laos as a pilot for Air America. He is the author of the critically acclaimed comic novels Nam-A-Rama and Goodbye Mexico, and won the Pirate's Alley Faulkner Society first prize for fiction with his short story, "Train Wreck in a Small Town." A successful entrepreneur, he is currently CEO of Molecular Resonance Corporation, which has developed technology to spot and disarm improvised explosive devices. He lives with his family near Seattle, Washington.